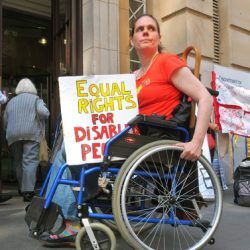 The Disabled people’s movement has for decades been fighting discrimination and campaigning for equality and human rights for Disabled people. Inclusive education is one of the key pillars of independent living and a human right, as set out in Article 24 of the UN Convention on the Rights of Persons with Disabilities. Inclusion in mainstream society right from the start is essential if Disabled people are going to take our place in society as equal citizens. It is essential for non-disabled people to grow up with Disabled people as friends, classmates and family members if they are to understand that we are part of society and including us is not optional. We want Disabled People’s Organisations to be part of our work – you can find out more about our Inclusion Champions project here. We provide resources (see below) for those pushing forward the inclusion agenda. We campaign for the right of all disabled learners to be fully included in mainstream, not segregated from our peers, our friends, our families, our communities. Join us.